I hate construction…I miss you, blog! Been trying not to update the blog while it’s under construction. Should be working on construction but a break to write feels nice. Plus I’m super stoked on some stuff. Have you heard of Buying Shots for Bands? They are a small group of writers, photographers and above all, music fans who interview some of my fave bands (and do shots with them). Pretty rad idea to me. They are celebrating their 1st birthday this year with a Bands vs. Blogs dodgeball game! It’s going to be so much fun! I’m playing with some of my teammates from the Parkdale Dirt Squirrels (two time 1st place champions of Toronto Sport & Social Club)! I’ll be playing for this blog, and some of the other squirrels will be playing for the Four Treasons blog. I’ve missed dodgeball. How do you feel about some guest-bloggage here? I know I mentioned it on Twitter and all, but Elissa (yes, hetero-life-partner Elissa) is going to be in 4 different states in like, one week or something! And I think that number may actually be 5 because she drove from New Orleans, Louisiana to Austin, Texas and I think she may have driven through Alabama on her way. When she gets back from all of her travels, I’m hoping she’ll write a guestblog on her travels. Elissa is wicked cool, and travels so much. Plus she’s a great writer and since and talk about her so much she should really make a personal appearance on the blog. I’m hoping she’ll share lots of her smarts and funny things she encountered living in New Orleans, driving to her new apartment in Austin, taking a trip to Montana and then visiting her mom in her hometown East Lansing. Girl has been (and lived) everywhere! Going to have to have my American Girl sign me up for a Spotify account too so that I can use it! I’m going on a real camping trip this weekend – no glamping! Heading to Algonquin so I’ll be off the grid for awhile. Going to roast marshmallows, make spidey-dogs (while trying to overcome my fear of the real-life spideys), hike, swim & climb. Most importantly, I’m going to relax and enjoy sounds. Like the sounds of a nice cold beer opening. When I come back, the new blog is going to be PIMP and ready for your eyes! 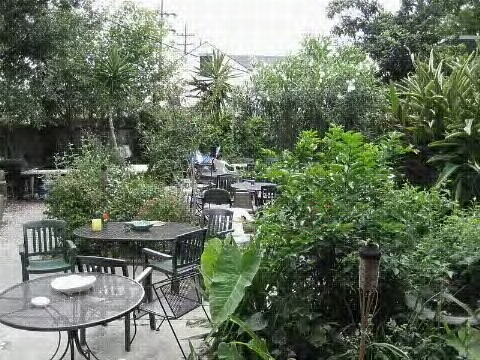 Bacchanal – that lovely wine bar/garden we went to in New Orleans. Its right on the river and across from a U.S. Naval Base that turned away many of the poor after Katrina. Elissa reminded me today of this fun fact we learned about Bacchannal. This area, although right across from the river, didn’t flood during Katrina. It is in what’s called the “sliver on the river” that is above sea level due to the river depositing silt along its banks. Not only did this bar survive the levee’s breaking, but looters only took the spirits and small amount of cash and did not touch the wine and Bacchannal was able to reopen sooner. We In The Nola, Baby! Spent the last week in New Orleans visiting an old roommate/best friend/former coworker. We were there for Mardi Gras and then a few days after so we had a chance to party and then do the touristy things when the roads were open again. This was one of my favourite days in New Orleans. 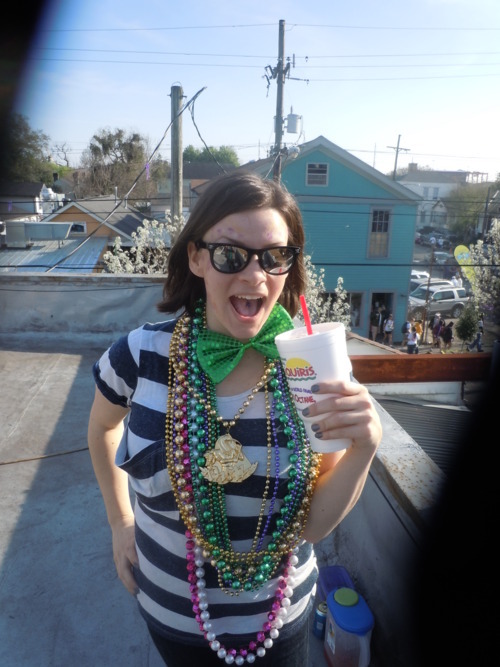 This was during the day on Mardi Gras (Mardi Gras means fat Tuesday and in reality my vacation was more like 8 days of fat). We went to pick up daiquiris and then headed down to the parade route. Elissa and Mara knew someone who lived on Magazine Street with a roof top looking onto the parade. Contrary to the wet dreams rumours that float around, you don’t have to take your top off for beads. (Although if you want to, the leering old men on the balconies on Bourbon Street will probably love it.) I went to Bourbon Street and the French Quarter twice during mardi gras and only saw girls too drunk to walk nevermind lift their shirts. 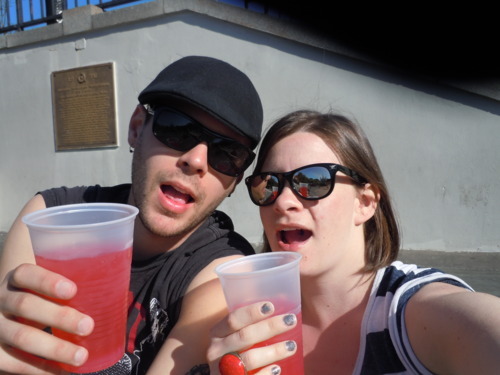 Drinking hurricanes in front of Jackson Square. 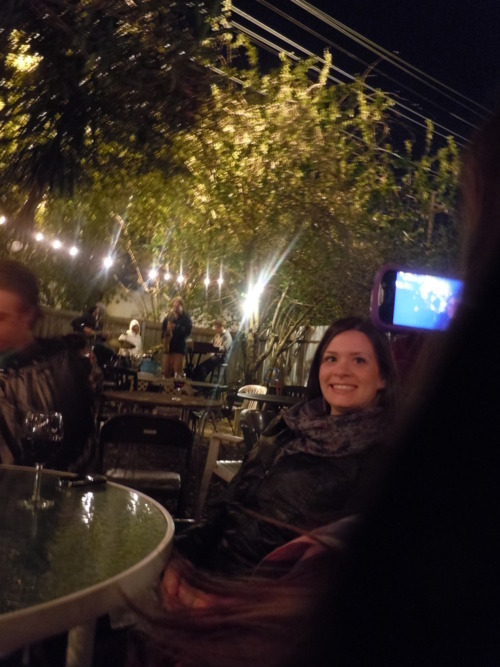 Drinking at Bacchanal – a backyard wine bar with a live band. There were also chefs to cook anything from steak dinner to oysters and a man to cut up your choice cheeses and serve on a platter. You could buy wine from $10 to $200 bottles. We did and saw so many great things! We took a tour of famous Lafayette cemetery and saw the oldest cemetery (St. Louis I), went on an Abita brewery tour, saw SO many parades, saw live bands, went to a Trombone Shorty concert, went shopping on Magazine Street, ate fresh oysters (and alligator and crawfish and catfish, and…), tried shrimp n’ grits and po’boys (remember how I said fat? ), drank wine, beer and daquiries, tried the touristy Hurricanes and Hand Grenades, danced in the streets, caught beads, drove over the Causeway Bridge and so much more!